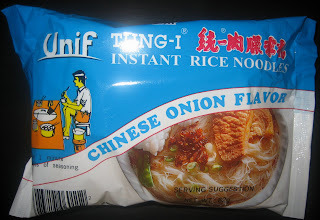 This pack of noodles comes from Taiwan and contains rice noodles (mifun) instead of the usual ramen. 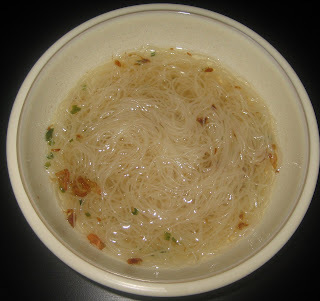 Note that these noodles are different from rice vermicelli, in case that is what you are looking for. It is quite small (62g) but rice noodles tend to absorb a lot more water than ramen noodles, so it feels like you are eating more than 62g. The flavor of these is based on fried red onion, which is a very common ingredient in Chinese dishes such as fried rice and fried mifun. The rice noodles are very soft and don't really have much flavor, especially compared to ramen noodles. 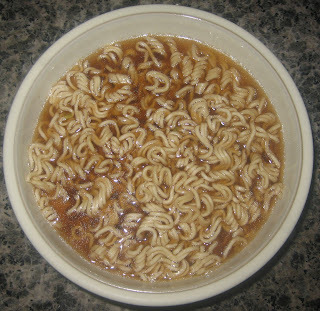 In this case, they are pretty much tasteless filler to provide contrast with the strongly flavored broth. That's not to say that they seem out of place, however; mifun is commonly used in this manner in Chinese cuisine. The broth is nice and savory, tasting of pepper and fried red onion. As you can see from the picture, there is a good amount of scallions and fried red onions, which adds a little color and variety of texture. I like the broth, but it is almost boring because this is such a basic and common flavor. But that is just my own personal preference, so if you like the flavor of fried red onion, then you should definitely try this pack! I was extremely surprised to discover that this is the first review of Sapporo Ichiban on this website. I grew up eating these all the time, but for some reason I've been focusing on more exotic varietals recently. 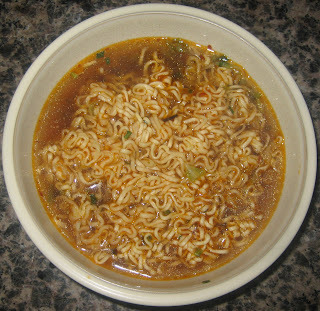 This is one of the most common imported brands of ramen in the US; I think I have even seen it at the local grocery store (Ralph's), although it is still much cheaper to buy at the local Asian supermarket (99 Ranch Market). 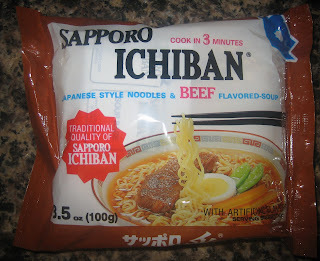 Sapporo Ichiban is imported from Japan and is a major competitor to the Nissin line of instant noodles. There is only one flavor packet in the Sapporo Ichiban package, so it is quick and convenient to make (as if instant noodles weren't already quick and convenient enough!). The noodles themselves turn out whiter than the packaging indicates, although that's no big deal. Fresh ramen is generally yellowish, so I guess that's why they made the picture more yellow. These noodles are thick and chewy and have a delicious nutty flavor. Sapporo Ichiban instant noodles are on the larger side (100g), so you do get a lot of noodles. The broth is nice and intensely beefy. There are also a few scallions which give the broth a little more flavor, although it is still tastes quite simple. Despite the straightforward flavor of the broth, it is still has a nice hearty taste, which is quite typical of the Sapporo Ichiban brands. 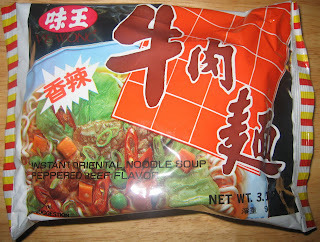 The noodles themselves are able to absorb quite a bit of the broth's flavor, which is nice. I enjoy this pack of noodles because it is relatively plain, yet contains flavorful noodles and no offending qualities.